Mendota Standard Collars and Hunt Collars are measured from the middle of the buckle to the middle adjustment hole. This allows 2" of adjustment smaller and 1” larger. There is no need to add inches to the actual measurement of your dog's neck. 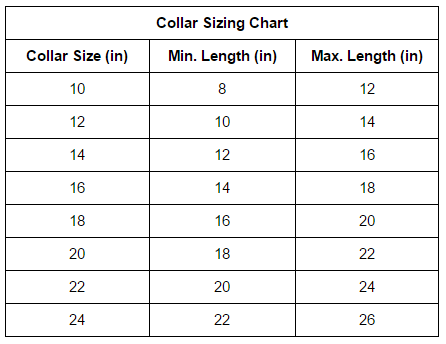 The size of the dog's neck is the collar size needed. Simply measure your dog's neck at the base with a measuring tape or string. Allow room to slip two fingers between the measuring tape or string and your dog’s neck comfortably for the proper collar size. You can also use your dog's current collar measurement if it fits correctly. Just unbuckle the collar, lay it out flat and measure from the adjustment hole being used to the centre of the buckle. We have found that this is usually the most reliable measurement to use.